Dr. Anna Firshman is an associate clinical professor and specialist in large animal internal medicine at the College of Veterinary Medicine. She received her veterinary degree from Liverpool University, England in 1999 and became a Diplomate of the American College of Veterinary Internal Medicine in 2003. 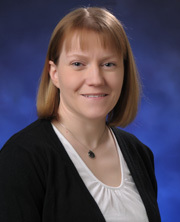 She obtained her PhD from the University of Minnesota in 2005 and then joined the faculty at Oregon State University College of Veterinary Medicine. She joined the faculty at the University of Minnesota in 2009 and became a Diplomate of the American College of Veterinary Sports Medicine and Rehabilitation in 2010. Dr. Firshman has a special interest in equine exercise physiology, conditioning and rehabilitation therapy and received her certificate in equine rehabilitation from the University of Tennessee. Dr. Firshman specializes in Large Animal Internal Medicine and is a charter member of the American College of Sports Medicine and Rehabilitation. She works with all large animal species and enjoys all types of large animal medicine cases. Her expertise centers on internal medicine disorders of horses and camelids, and she has particular interests in neurology, endocrine disorders, neonatology, cardiology, equine performance problems, and muscle diseases. Dr. Firshman’s research interests focus on muscle diseases and endocrine disorders. Her recent research activities involved the study of the effects of underwater treadmill exercise on muscular response and fitness in horses and on glucose and insulin metabolism in camelids.